Home > Blog > Featured > 2012 Annual digital magazine out now! 2012 Annual digital magazine out now! 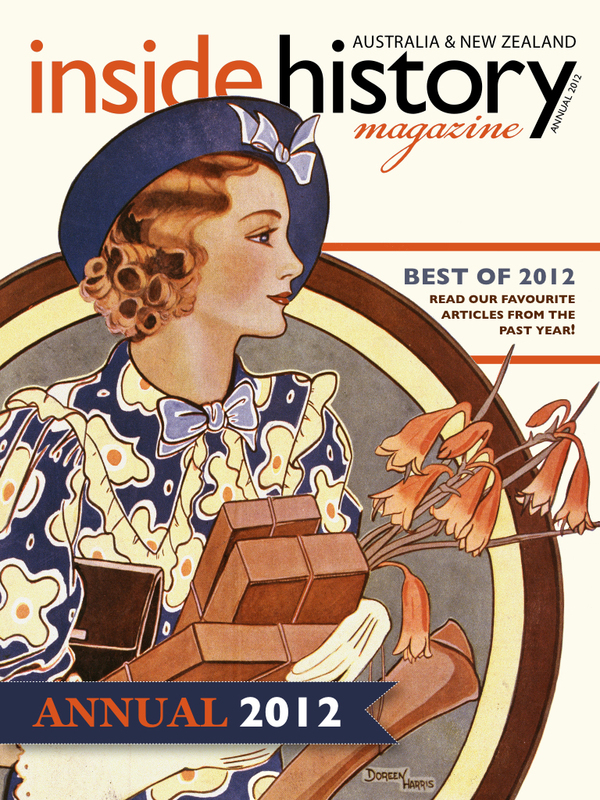 Our favourite stories from 2012: the first ever digital annual edition of Inside History is available! It’s been a big year at Inside History: 2012 was our first full year of publishing both print and digital issues, and saw many exciting new features, exclusives and collaborations. “To celebrate, we decided to share the Inside History team’s favourite features from the past year’s issues in our first ever annual edition,” says Inside History’s editor, Cassie Mercer. It’s available for iPad, Zinio and all your other digital devices, from your desktop computers to Android tablet! “Showcasing the usual breadth of family, local and social history featured in Inside History, an array of fascinating historical characters will jump off the page (or screen, as it were) to greet you in this edition,” says Cassie. There’s a surgeon who tended the sick on a convict ship, a group of rural pioneer women that helped win voting rights for women in Victoria, and an intriguing family from Wyalong, NSW who sent five sons and two grandsons off to World War I. Of course, the antics and exploits of convicts are always a sure favourite. For a romantic angle to early convict history, an amusing read is found in our examination of convicts’ attempts to sneak around colonial authorities’ regulations on their private lives – but was it really all in the name of love? And, for a heart-warming serving sprinkled with nostalgia, feast your eyes on the feature by Sydney Morning Herald Good Cafe Guide editor Jill Dupleix on her favourite family recipes and the stories behind them. And if dishes passed down through generations can be an unconventional family history source, so too can travel! Explore the past through sites, spaces and streetscapes with our list of 15 fascinating history destinations across Australia and New Zealand, showcasing our diverse heritage. Finally, Inside History wouldn’t be the same without its practical emphasis on family history research. Revisiting Trove, we share the staff’s helpful tips and hints on how to best utilise this fantastic resource, plus our digital spotlight recaps the free, cutting-edge tools set to enliven your research. Finally, in a favourite from our Lost Diggers focus, Australian War Memorial researchers discuss the challenges of identifying unnamed soldiers in their photographic collections, which could well help you with your mysteries of your own. We hope you enjoy reading this edition as much as we enjoyed putting it together! Inside History’s annual 2012 edition cover price is $6.49 and is available worldwide from 19 December on iPad via the App Store and Apple Newsstand, and for Android and other digital devices from 7 January through Zinio. Our app can be viewed via the App Store here. For more information, please contact editor, Cassie Mercer.